We are all changing, whether we refuse, tolerate or embrace it. 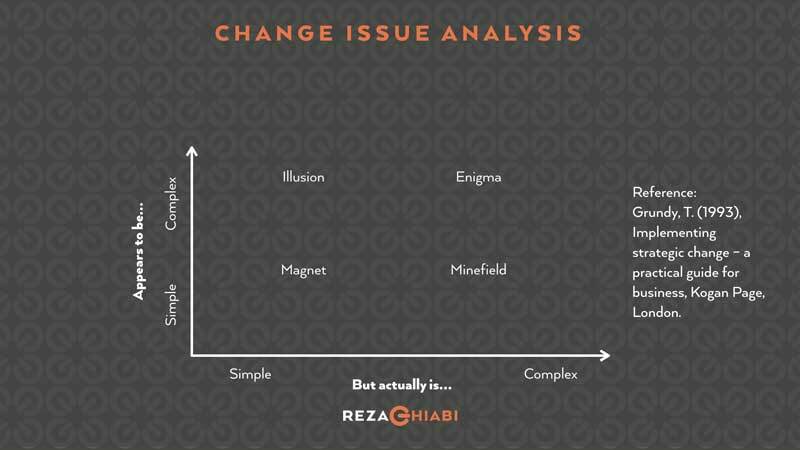 Getting closer to Norouz —the Persian New Year, got me thinking about what is your strategy towards change? Well, I think It’s simple, you can either refuse, tolerate or embrace it. This applies all aspects of our life, from individual to organizational and from personal to professional levels. Continuing my journey to explore how innovation can change our collective perspective, I think it is essential to pay more attention to the way we perceive CHANGE and manage different aspects of it. That is why in this article I’m trying to provide the readers with my most 8 favorite tools to understand, thus control change in life, your business, and in general wherever a group of people exists. First, let me be clear by what I mean when I say “change”. According to Google’s dictionary change means “make or become different”, or “take or use another instead of”. According to Wikipedia, change refers to an array of different disciplines form Arts to Management and Math. By change I mean “positive change” and by positive I mean how this “becoming different” serves strategic objectives that we define, that simply being used to do good. For other types of change, you may refer to the word “manipulation” which is a totally different story. 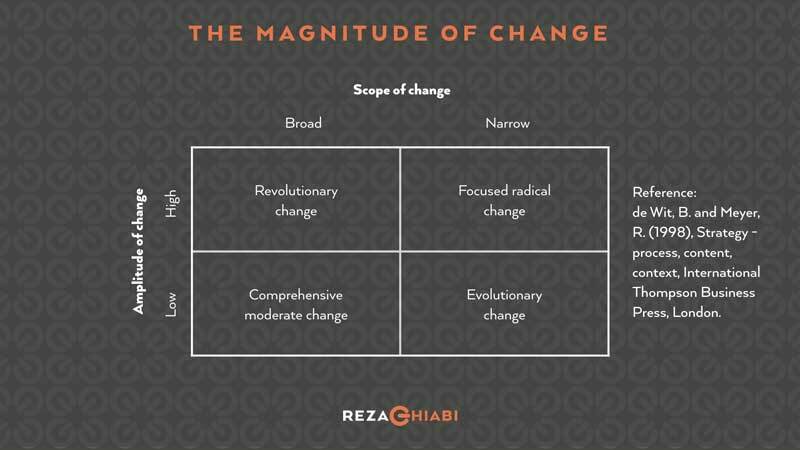 This matrix supports understanding of the magnitude of change, in terms of two key dimensions: the scope of change (broad vs. narrow), and the ‘amplitude’ of change. 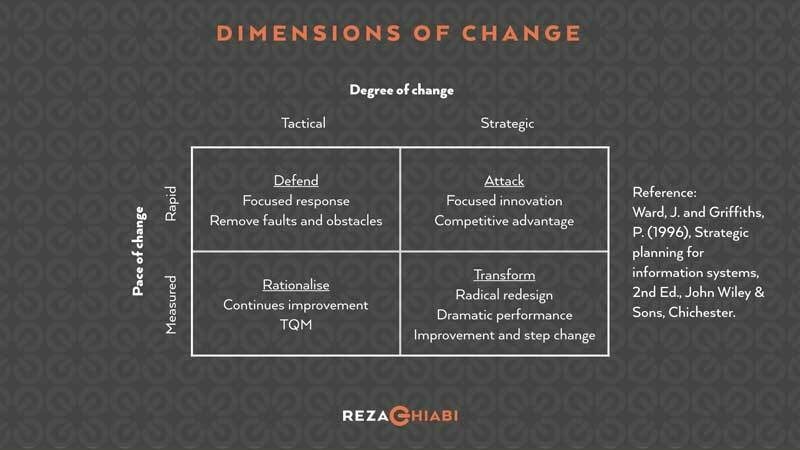 This matrix highlights two key dimensions of change (degree and pace of change), which together influence the most appropriate type of strategy for dealing with or implementing the change. 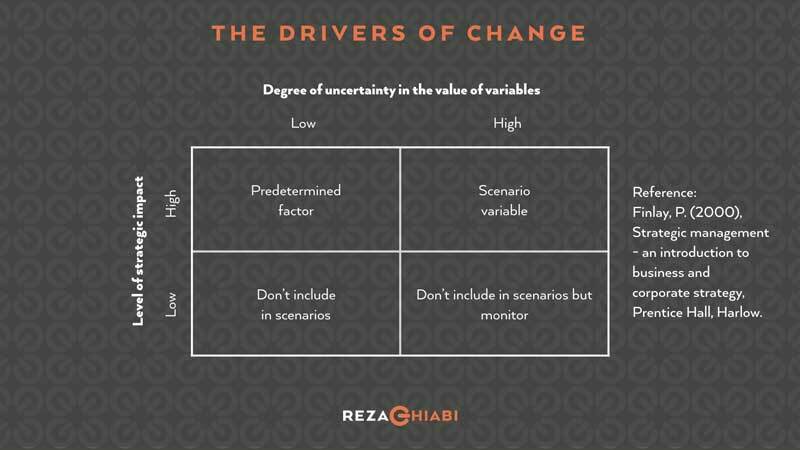 This matrix supports understanding of the relevance of drivers for change, on the basis of two key dimensions: the degree of uncertainty in the value of variables, and the level of strategic impact. The approach can be used to assess factors when developing future scenarios for strategic planning. 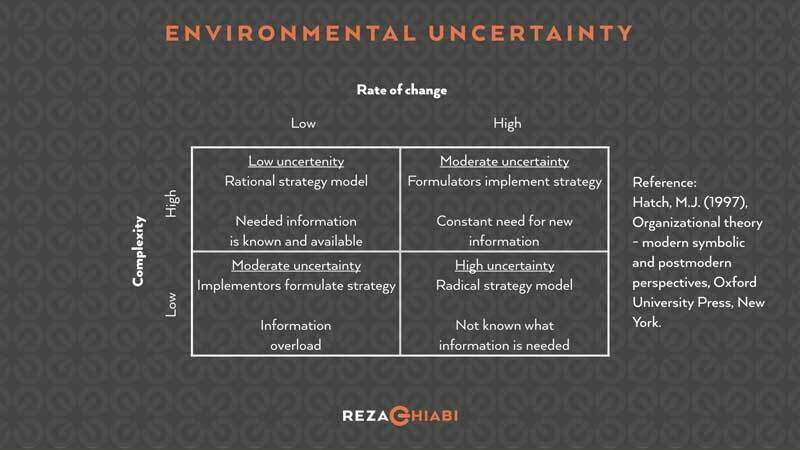 This matrix supports understanding of environmental uncertainty, in terms of two key dimensions: the rate of change, and the complexity of the environment. The appropriate form of strategy is shown, together with the information requirements. 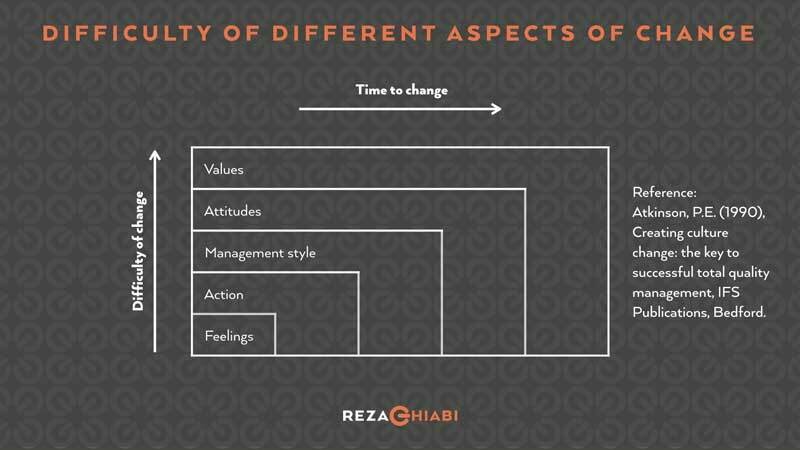 This framework supports understanding of the level of difficulty associated with change, and the time that it takes to effect change, ranking feelings, action, management style, attitudes and values (in order of increasing difficulty and time). This framework supports understanding of the perception of issues that impact on change, in terms of how things ‘appear to be’ vs. ‘how they actually are’. 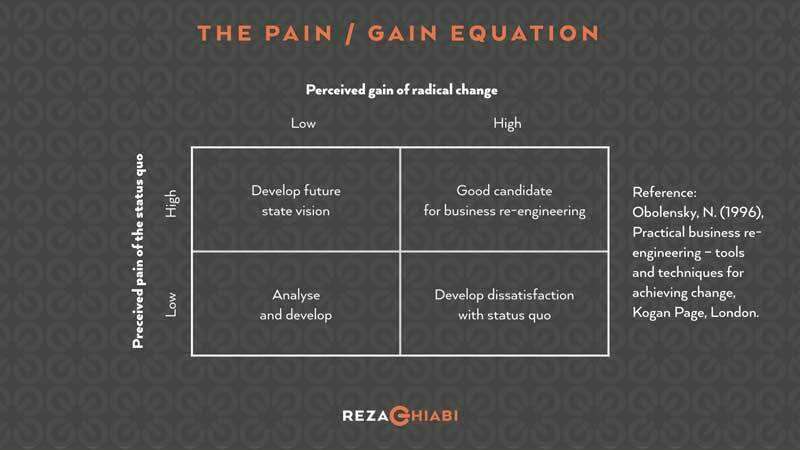 This matrix supports change management, in the context of business re-engineering (and the associated change, which is likely to be significant), in terms of two key dimensions: the perceived gain of radical change vs. the perceived pain associated with the status quo. 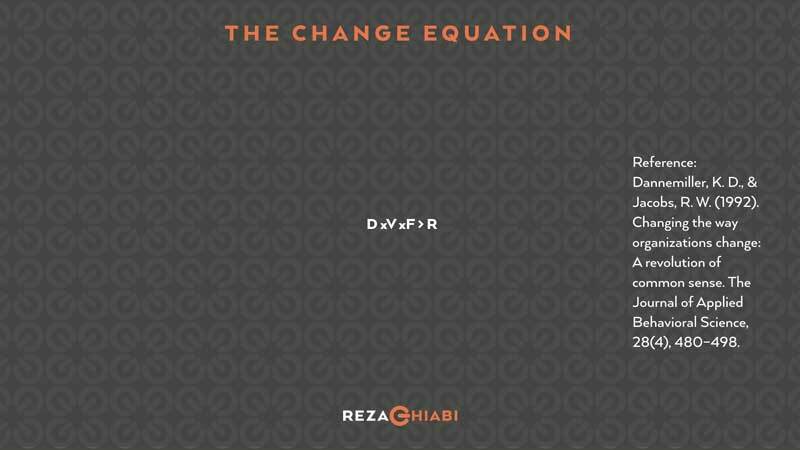 This equation supports the relationship between Dissatisfaction with how things are now, Vision of what is possible, First concrete steps that can be taken towards the vision; to be multiplied together to be greater than the Resistance. Because D, V, and F are multiplied, if anyone is absent (zero) or low, then the product will be zero or low and therefore not capable of overcoming the resistance. You may also download the high-resolution toolkit of this article here on my Slideshare. Happy Nowruz 1397 and Iranian New Year!